Tomato is eaten raw in salads or cooked as a vegetable and is a frequent ingredient in soups and stews. It is found in most pizzas. 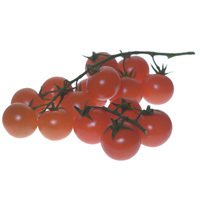 Tomato is used in sauces, pickles and chutney, which is often made from green tomato. Allergy Information: More than 50 cases of food allergy after eating tomato have been reported. In general, tomato allergy is associated with allergy to either latex or pollen. The symptoms reported were rather different in the two groups. The patients with no latex allergy reported mostly the oral allergy syndrome with some skin reactions such as urticaria (hives). Patients with latex allergy reported urticaria as the most common reaction but 20% suffered anaphylaxis. Allergy to tomato is also linked to allergy to potato since they are related plants. Reche et al. (2001)  studied a group (A) of 30 non-latex-allergic patients, and a group (B) of 10 latex-allergic patients. In group A, the most frequent clinical symptom with tomato was oral allergy syndrome (OAS), although urticaria was the most frequent symptom in group B. In this group, anaphylaxis occurred in 20% of the patients. Foetisch et al. (2001)  revealed beta -fructofuranosidase, polygalacturonase 2A, and pectinesterase as further tomato allergens. Cross-reactivity to peanut and grass pollen has been observed by RAST inhibition assays (de Martino et al. 1988)  and by EAST inhibition assay (Petersen et al. 1996) . Kondo et al. (2001)  identified the proteins in tomato recognised by sera from patients with food allergy and OAS to tomato. These proteins were polygalacturonase 2A (46 kDa), beta-fructofuranosidase (22 kDa), superoxide dismutase (18 kDa) and pectinesterase (14 kDa). Diaz-Peralez et al. (1999) identified a chitinase present in tomato. Patients with the latex fruit syndrome displayed IgE binding to a band that was also recognized by a chitinase specific antibody (IgE- immunoblots), suggesting that chitinases present in latex as well as in a range of fruits are one cross-reactive allergen responsible for the latex-fruit syndrome. Identification of suberization-associated anionic peroxidase as a possible allergenic protein from tomato. Severe tomato allergy (Lycopersicon esculentum). Ubiquitous structures responsible for IgE cross-reactivity between tomato fruit and grass pollen allergens. Kondo Y, Tokuda R, Urisu A, Matsuda T.
There are only few studies on the stability of profilins most of them on celery profilin. Compared to other allergens, profilin is a moderately stable protein, more resistant than Bet v 1 homologues but less stable than lipid transfer proteins or corss-reactive carbohydrate deteminants of glycoporein allergens. Western blotting performed by Petersen et al (1996) showed that profilin contributes considerably to the IgE cross-reactivity between tomato fruit and grass pollen. Allergen properties & biological function:The allergen is tomato profilin which is thought to be an actin and phosphatidylinositol 4,5-bisphosphate binding protein involved in the regulation of the actin cytoskeleton and signal transduction. Allergen purification:Tomato profilin has been cloned and expressed in E. coli based on the tomato pollen profilin.The recombinant non-fusion protein was purified via PLP affinity chromatography (Willerroider et al. 2003) ; (Westphal et al. 2004) ). Lyc e 1 sequence shows a high degree of identity (76-86%) to other plant profilins such as cherry (Pru av 4), pineapple (Ana c 1), banana (Mus xp 1), carrot (Dau c 4), celery (Api g 4) and birch (Bet v 2). Bell pepper showed the highest identity (91%) (Westphal et al. 2004) ; (Willerroider et al. 2003) ). Lyc e 2 has been purified from lyophilized tomato extract by hydrophobic interaction chromatography and gel chromatography (Westphal et al. 2003) . The same authors have cloned and expressed the cDNA of two different isoforms of the protein, Lyc e 2.01 and Lyc e 2.02 in E. coli. The recombinant proteins were purified by electroelution and refolded.